There’s this sort of myth, which sprung up in the 2004-2008 period of the U.S. War in Iraq, that the world could not just tolerate Saddam Hussein’s cruel rule a moment longer than March 2003. This was used to justify the invasion retroactively when it turned out that there were no weapons of mass destruction, which was the original stated reason. Of course, it’s a bit odd on its face to claim that the cruelty of his regime was suddenly supposedly intolerable by the end of 2002 (more so given that it took more than four months between the U.S. authorization of force and the actual invasion), in a way that it had not been a decade and a half earlier, when he was an American ally. Moreover, not only was the Iraqi regime not actively committing some kind of genocide at the time of the invasion (again, not the stated reason for intervention at the time it happened), but the U.S. and the world had already pretty effectively contained the regime over the course of the 1990s. No, Iraq wasn’t doing great by the end of 2002 — it certainly couldn’t be expected to under the weight of massive sanctions from around the world — but it was probably more stable and less violent than it had been for quite some time. And that wasn’t by chance. 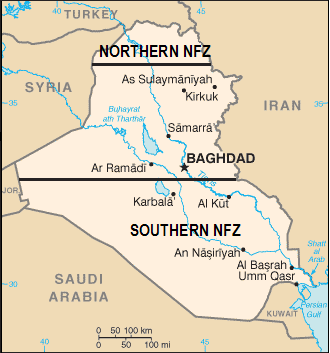 With US/UK no-fly zones operating continuously from 1991 to 2003 to protect the Kurdish population and the Shia population from Iraqi air campaigns — the U.S. alone flew more than 200,000 missions by the beginning of 1999, often taking a lot of Iraqi anti-air fire — along with other protective measures for the persecuted zones, the bad old days were basically over (by comparison to what preceded or followed anyway). Again, I recognize it was certainly far from ideal. Dissenters and sectarian minorities were still being persecuted at the hands of the regime in the Sunni areas and on the ground in the south, but that’s a situation that happens in authoritarian regimes the world over. In stark contrast with the 2003-2011 U.S. war, the ad hoc solution from 1991-2003 involved very little loss of life on either side — somewhere in the range of 50 people were killed during the no-fly zone operations — and it prevented the regime from going around bombing and gassing everyone (or sectarian extremists from killing each other). By the end of 2002, the world had a pretty solid handle on keeping Iraq stable and non-genocidal. Then George W. Bush’s invasion happened. At that point, the whole country broke. Just plain fell apart into total violence and an extremists’ free-for-all where everyone could avenge every old wrong. We had no plan, no resources, no experience, and not enough troops, and we just decided to wing it. And the inevitable result was just total pandemonium and wholesale destruction. We did that. That’s on us. And we never really did fix it before we left. (Which isn’t an argument for staying indefinitely, as I’ll get to in a moment.) There’s no way that was better than the default situation in 2002 where the persecuted populations were protected from mass slaughter and everyone else had it bad but weren’t living in an unending hell (one which never ended). Now as ISIS pours over the border from Syria, capturing four major cities (including the country’s second largest) and perhaps soon the northern oil fields, while the Iraqi Army falls back into a chaotic retreat, U.S. pundits — the war everywhere always brigade — are asking each other whether it’s time to re-intervene in Iraq. Look, I’m no isolationist. I’m actually even an advocate for humanitarian military intervention in many cases, to the point of annoying some other progressives. But I try to be smart about it and historically conscious. And right now, right there, this just isn’t one of those cases. Colin Powell is alleged to have once said, prior to the 2003 invasion, that there was going to be a “you break you bought it” policy on Iraq with regard to American involvement. Thomas Friedman dubbed this the “Pottery Barn rule,” in spite of Pottery Barn not actually having such a rule. But either way, one imagines that if you blew up an entire Pottery Barn store, you would not be asking “hey so do you think I should go back and help out?” two years later when someone else accidentally broke a vase. We need to stop “helping” Iraq. Tagged George W. Bush, Iraq, Iraq War Resolution, ISIS, Middle East, Syria. « Yeah, so why *isn’t* Charlotte Corday in the new Assassin’s Creed? Surprise! The “surge” in Iraq never worked.